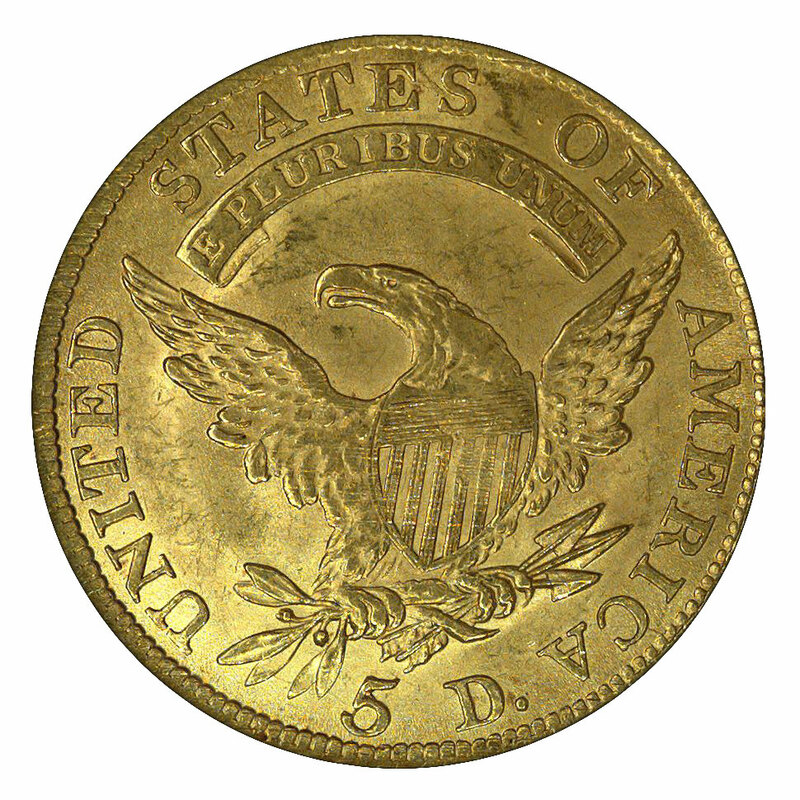 The half eagle, or five-dollar piece, was the most important gold coin during the United States Mint's early decades. 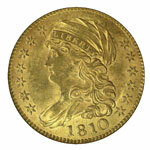 It was the first gold denomination issued, and it was the only one coined with any regularity from 1809 through 1820. During the years 1807-12, this denomination bore an attractive design by John Reich, second engraver to U. S. Mint Engraver Robert Scot. Known as the Capped Bust type, it is similar to half dollars of the time, and indeed both pieces are by Reich and debuted in 1807. On this type a bust of Liberty faces left. She is wearing a mobcap, a fashionable article of dress at the time. At the base of her cap is a banner reading LIBERTY. The portrait is surrounded by thirteen stars arranged seven left and six right. The date appears below the bust. The reverse of this coin type features a facing, heraldic eagle with wings upraised and a shield upon its breast. It grasps three arrows in its left claw and the olive branch of peace in its right (viewer's left). Above the eagle is a banner inscribed E PLURIBUS UNUM, while the legend UNITED STATES OF AMERICA is around the periphery. 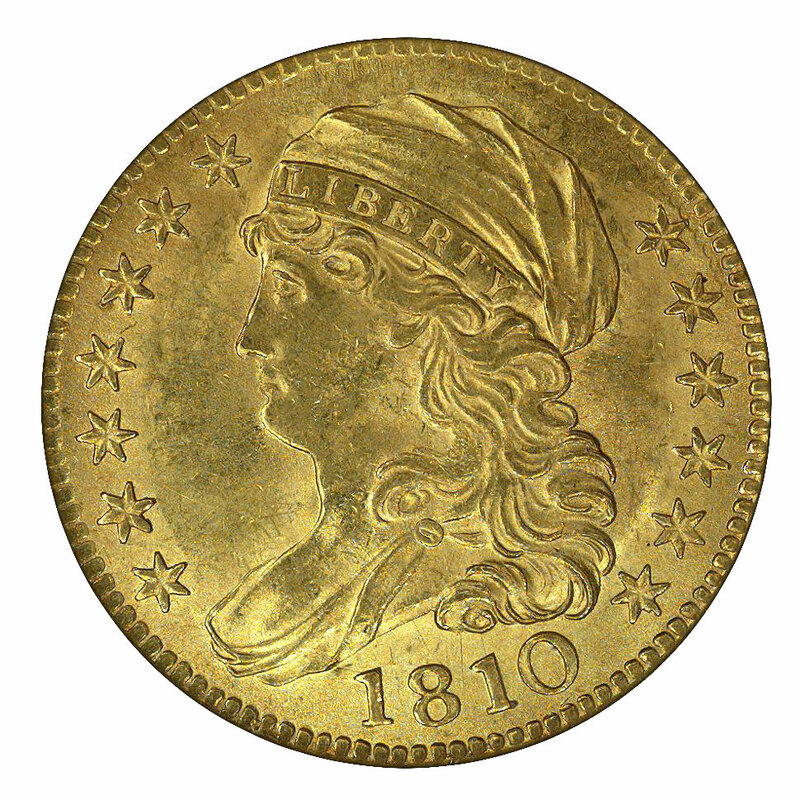 Below the eagle is the coin's value, 5 D.
While there are numerous varieties, these mostly being distinguished by differences in the size of hand-punched elements such as the date and value, the basic type did not vary from 1807 through 1812. There are also two overdate varieties, 1808/7 and 1809/8. The latter comprises the entire mintage dated 1809. Gold coins of this period saw only limited circulation. Earlier changes in the relative prices of gold and silver led to U. S. gold pieces having bullion values that exceeded their face values. In consequence coins of this type are seldom seen in grades below Extremely Fine. More common are ones grading About Uncirculated or Uncirculated. Most examples have been cleaned at one time or another, and examples possessing completely “original” surfaces are highly prized. The net effect of such cleaning will vary from coin to coin. If no harm was done to the coin's natural surfaces it will still be considered certifiable by the major grading services. Each of the dates from 1807 through 1812 is known for this series, though the date appearing on a coin does not necessarily represent the year in which it was minted. The date most commonly seen in mint state is 1810, with 1811 and 1812 following in second place. 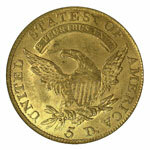 The typical Capped Bust half eagle is well struck, though there may be some weakness at its centers. Made in larger numbers than other gold denominations, these coins often display the frosty luster associated with worn dies. Examples that have never been cleaned or were cleaned generations ago may show some orange-russet toning, particularly within the more protected areas of the design and legends. Since Capped Bust half eagles are fairly expensive in mint state, many collectors assembling a type set may seek as an alternative one grading Extremely Fine or About Uncirculated. Many circulated coins have been cleaned in the past, but that needn't be a deterrent to finding an attractive example. Attempt to find a coin that has a good strike and even wear. Pay especially careful attention to identify damage or repairs. Often these surface impairments may be deceptive and difficult to spot. Perhaps the best guide to what constitutes a desirable type coin is to acquire one that is already encapsulated, especially as any surface conditions will be properly disclosed if graded or details graded by NGC. This will eliminate a lot of uncertainty.